A new landmark has appeared in the river at Limehouse. It’s life-size metal figure of a man from Antony Gormley’s Another Time series and stands on a mooring post near the shore. The residents of Narrow Street on the north bank have the best view. The man, who at high tide today did not disappear, could be thought on occasion to be standing or walking on water. The best view from the Thames Path on the Rotherhithe bank is at Pageants Stairs near Lavender Dock entrance. 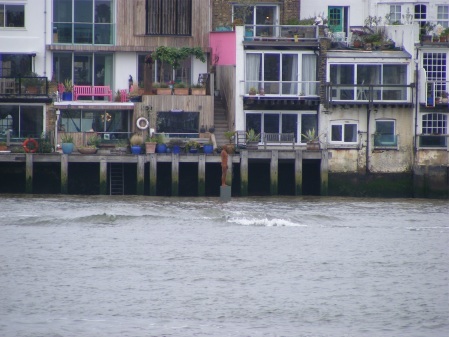 The figure is seen just downstream from The Grapes pub opposite.